“Ek glo dat ons almal moet teruggee in die lewe. As ’n mens gesond is, is jy ryk. Ek help altyd waar ek kan en besef elke dag hoe bevoorreg ek is. Die publiek gaan mal wees oor dié vertoning, want dit word deur ’n span wêreldklas-tegnikuste behartig en ondersteun deur kunstenaars met groot harte,” sê Ampie oor die geleentheid om hierby betrokke te kan wees. It Is Time For Jakaranda Children’s Home Annual Festival Of Lights! December is finally here and it is time to relax and spend some time with your family. Now you have the opportunity to book an outing with your loved ones, which not only promises to be lots of fun but can also make a difference in the lives of those children who do not get to spend the holidays with families. By supporting the JAKARANDA KINDERHUIS LIGGIEFEES, from 1 to 31 December 2018, you will not only be making a contribution towards the future of Jakaranda Children’s Home’s 210 inhabitants, but also get to experience an enchanting spectacle of the most beautiful Christmas lights and music. Festivalgoers who attend the JAKARANDA KINDERHUIS LIGGIEFEES can look forward to being entertained by various musicians on selected evenings, like Dewald Wasserfall, EON, Saarkie, Joshua na die Reën, Tussen Sterre, Heuning, 2nd Life, Ampie, Sharoney and many more. “I believe that all of us should give something back to the community. When you are healthy, you can consider yourself rich. I always try to help where I can and this reminds me of how blessed I truly am. The public will absolutely love this event, because it boasts the talent of world class technicians and will be supported by artists with generous hearts,” says Ampie about the opportunity to be involved in this project. In addition to lights and music, visitors can also expect good food and craft stalls, as well as fun rides for the kids. 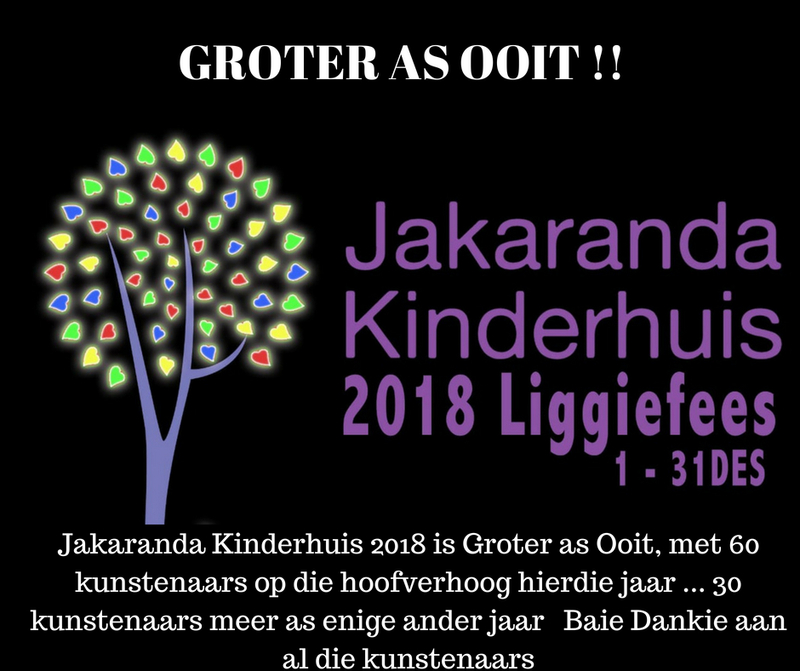 The JAKARANDA KINDERHUIS LIGGIEFEES is proudly supported by Pretoria FM, Coastal Hire, dW Audio & Backline, Ehlers Attorneys, Status Hiring, Waste Group, Unlimited Events Group and LaserX. The premises of the children’s home is at 1 Talitha Kumi Street in East Lynne, Pretoria and can be visited from 18h00 to 22h00 daily. On concert days, the gates will open at 17:00 and tickets will be available at R30 per person. 14 December: Eunice Kemp, Henry van Dyk, Elme Churr, Riaan Grobler, Ricky Faber, Die Ventertjies, including a Laser X show! 15 December: Lieflinge, Harlind, Sharoney, Klikkerland, Irene-Louise van Wyk, RNK, including a Laser X show! The children and staff of Jakaranda Children’s Home are looking forward to being your host. Don’t miss this wonderful event! If you or your company would like to become an official sponsor of or want to make a donation towards the JAKARANDA KINDERHUIS LIGGIEFEES, please contact Gary van Veenhuyzen directly at marketing@jacarandachildren.co.za or 073 844 9994 for more information. Your contribution will be greatly appreciated.